It’s no secret that one of the Yankees biggest needs this offseason is pitching. As it is right now, the starting rotation features a lot of unknowns, and a couple of knowns that aren’t all that enticing. Unfortunately, this is an unseasonably uninspiring free agent market for starting pitching. Should the Yankees bite the bullet and go after the best pitcher on the market, even if he’s going to be 37 soon, and was never really any good until he was 35? OK first of all, let’s talk about the Yankees’ rotation options for 2017. The one guy we can depend on to be good is Masahiro Tanaka. Sure, he might end up injuring his elbow, but you know when he’s out there he’s going to be great. After that, we’re in some dicey territory. I guess CC Sabathia would slot in as the number two starter. While CC seemed to finally adjust to his diminishing stuff by learning to pitch last season, it’s really hard to tell for sure what we’re going to get from the big lefty in his final year in pinstripes. Also, he’s got a history of knee problems that aren’t getting any better. Number 3 would be Michael Pineda, who had 207 Ks last year, but all of his other numbers were horrible. Right now, the rest of the rotation is pretty much up for grabs. The Yankees have announced that Adam Warren will come to camp battling for a starting job (what else is new for him?). There’s Luis Severino, whom I don’t think the Yankees should give up on as a starting option yet, but he’s been just abysmal as a starter. Just awful. After that, there are a couple of last year’s surprises, Luis Cessa and Chad Green, as well as Bryan Mitchell, who is coming off of a toe injury that kept him out for most of 2016. None of those guys are sure things either, especially Green, who had a Tommy John surgery scare at the end of last season. So you see? The Yankees need some more concrete answers in the rotation, or they could be in for a long year. Enter Rich Hill. Yankees fans might be familiar with Hill from a couple of seasons ago, but we’ll get to that shortly. He was originally drafted by the Cubs out of Michigan in the 4th round of the 2002 draft (technically, it was the third time he’d been drafted, but he chose not to sign the other two times). He made his debut in 2005 and spent four seasons on Chicago’s North side, including his only full season in a major league rotation in 2007 (32 starts). Over the next five years, fighting injuries and ineffectiveness, Hill played for the Orioles, the Red Sox, the Indians and the Angels, before finding himself on the Yankees on August 5th of 2014, after the Yankees had allowed the Nationals to claim Matt Thornton off of trade waivers and found themselves without a LOOGY. Hill spent basically all of August and September as a lefty specialist for the Bombers, racking up just 5.1 innings in 14 games, but putting up a pretty good looking 1.69 ERA in the process. At the end of that season, the Yankees let him go to free agency, and they were right to do it. There was nothing Hill did on the Yankees that even hinted at the renaissance he was about to experience in his career. He signed a minor league deal with the Nationals for the 2015 season, but didn’t make the bullpen out of spring training. After spending some time in AAA, he opted out in late June and signed with the Long Island Ducks of the independent Atlantic League. He eventually signed with the Red Sox, and was called up in September. On September 13, he made his first big league start since 2009. It’s here that something clicked for Hill. Over the last month of the season, he made four starts for the Sox. All four were quality starts. He struck out 10 batters in three of them, and threw a 2-hit shutout on September 25 against the Orioles. Say what? 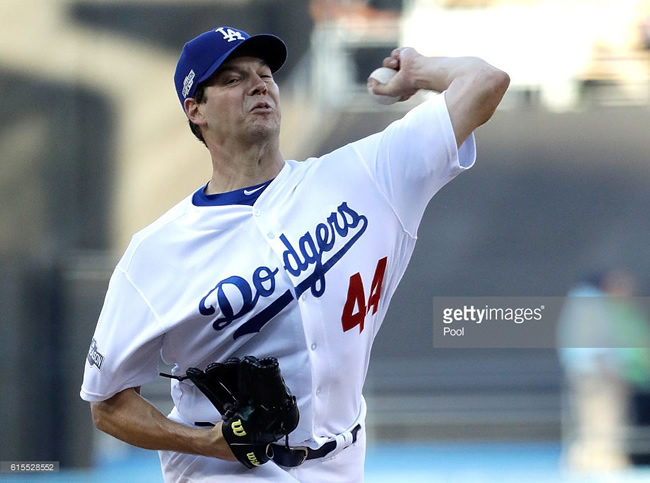 Was this the same Rich Hill we’d seen floundering around the bigs for ten years? Surely this was just one of “those months” where a veteran puts it all together just in time to get signed by another team the next season so that he can return to mediocrity… right? Wrong. Hill did parlay his month-long Boston party into a nice deal for $6 Million with the Athletics, but he did not immediately return to mediocrity as you would expect. The good times kept rolling on. Through his first 11 starts of the 2016 season, Hill went 8-3 with a 2.25 ERA. He was absolutely dealing again, striking out 74 batters in 64 innings, and the league hit just .207/.299/.267 against him. Unfortunately, a tweaked groin put him on the DL for all of June. When he came back in July, he pitched two more gems for the A’s before a blister landed him right back on the disabled list. The Dodgers, desperate for pitching after having their rotation decimated by injuries throughout the season, struck a deal with the A’s for the injured Hill and outfielder Josh Reddick. Hill started his Dodgers career on the DL, but returned in August for the stretch run. He dominated again, making 6 starts the rest of the way and pitching to a 1.83 ERA. The NL hit just .182/.213/.248 against him, and he struck out 39 in 34.1 innings. He even tossed seven perfect innings on September 10, but was pulled from the game due to blister concerns again. He struggled in the NLDS, but pitched another gem in the NLCS to close out his season and enter free agency on the highest of notes. Overall, since his tenure with the Long Island Ducks in 2015, Hill’s pitching line is pretty incredible. In 23 starts, he’s 14-6 with a 2.00 ERA. In 139 innings, he’s struck out 165 batters and the league has hit .184/.256/.251 against him. For a guy who was basically a failed pitcher who only hung around because he’s left-handed and crafty, these numbers are almost surreal. So how does he do it? He does what every crafty lefty is supposed to do. He keeps hitters off balance with breaking balls and changes arm angles to make it harder for batters to pick his pitches up. It’s as simple as that… sort of. You have to have a killer breaking ball in order for this strategy to work. Hill’s curveball has always been top notch. He’s just only recently learned to truly rely on it. Makes sense, right? Hill’s fastball, which averages 91.3 mph, isn’t going to get too many guys out if he throws it all the time, so he instead turns to his best pitch, his curveball. In fact, Hill throws a couple of different curveballs. Some are the traditional loopy 12-to-6 kind, while others have more bite, more like a slider. Secondly, he uses all sorts of different arm angles to throw every pitch in his arsenal, which makes it seem like he has 10 or 12 different pitches, and makes things very difficult for a batter trying to figure out what’s coming next. So, now that we’ve gotten to know Hill’s story, and what he brings to the table, I think I’ll answer the question posed at the beginning of the article. Should the Yankees take a chance on him? Yes. First of all, Hill’s age, and relatively small track record of success could be a concern, but they could also be an advantage to the Yankees. Because of his history, Hill is probably limited in what contract demands he might be able to put on the table. I can’t see him getting more than a two-year deal, or three years max. He’s probably also going to be limited by how much money he can ask for too. If the Yankees can get him on a short term deal, for 12 or 14 million per, I think they should jump all over it. As I mentioned in my post about Mike Napoli, every youth movement needs veteran leadership and stability. Hill could, in theory, provide both as the Yankees wait for their current crop of rookies to mature, and for guys like James Kaprielian, Justus Sheffield, Dietrich Enns, Chance Adams, Jordan Montgomery and Domingo Acevedo to arrive further down the line. Unless they decide to use some of that depth to swing a deal for a guy like Chris Sale, which would change everything.